See the lights – for sure! The holiday lighting displays these days just aren’t what they used to be. Maybe it’s just that the Clark Griswolds of the world belonged to another generation. Instead of following Google Maps or your Nextdoor App around town, trying to find displays, put your phone down and drive over to the Rochester Dome Arena, right here in Henrietta. Outside the Dome, the Festival of Lights guarantees you a full mile of spectacular holiday displays, one after another. 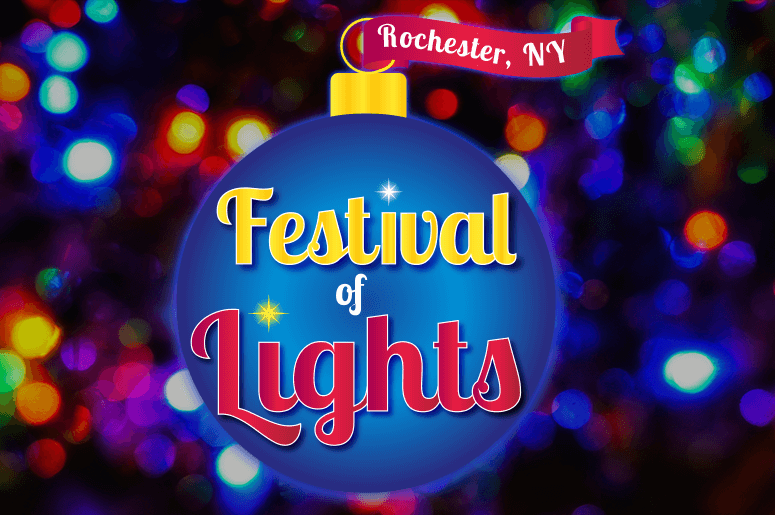 Since you can enjoy Rochester’s only drive-thru music and lights experience from the comfort of your car, it’s a truly family-friendly event. Just tune your radio to 90.9 FM to enjoy a musical experience designed to perfectly accompany the festive scenes you’ll be taking in. Though the drive-thru Festival of Lights is exciting enough to build a tradition around, there’s more fun in store. The North Pole Village makes this an indoor/outdoor extravaganza. Once you’ve parked the car, head into the Dome Arena for a variety of activities and concessions. Little ones can meet Santa (or just write him a letter), let loose in bounce houses, decorate stockings or cookies, and more. Parents will find the North Pole Village to be the perfect setting for capturing family holiday photos. The Festival of Lights and North Pole Village will be open from 6-10 pm for 23 nights in November and December (Nov 23, 24, 30 & Dec 1, 2, 7-9, 14-16, 19-23, 25-31). Note that it will be closed on Christmas Eve. Ticket prices vary depending on where you buy them and when you want to attend, so check the ticketing page for specifics. Proceeds will benefit The Salvation Army.